Camden Council’s Bloomsbury ward Councillors are hosting a meeting to discuss air quality in Bloomsbury and Fitzrovia, and Camden’s Licensing Policy this Monday. Bloomsbury and Fitzrovia have very low levels of motor vehicle ownership but some of the highest pollution levels in the UK. 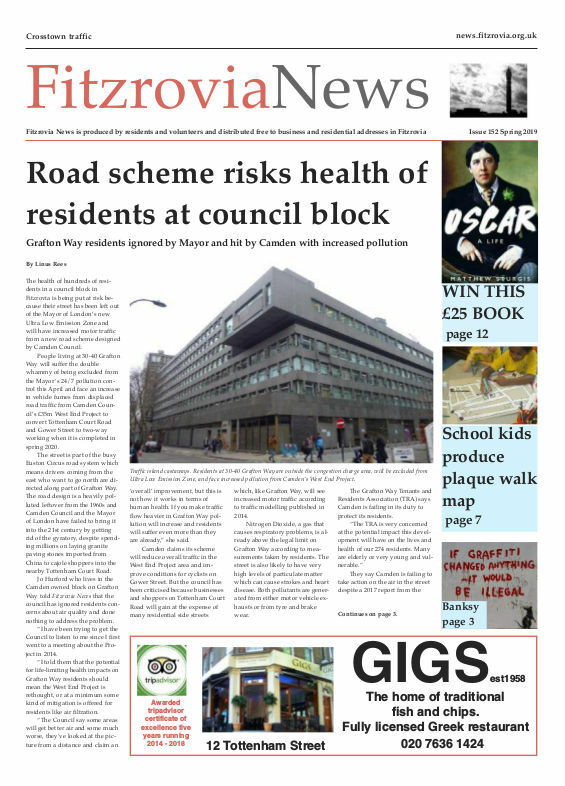 Councillors Sabrina Francis, Adam Harrison, and Rishi Madlani invite Bloomsbury ward residents to views on the air quality problem, and how licensing policy could better address local concerns about the social impact of sales of alcohol. “We will hear from Cllr Meric Apak, cabinet member for sustainability, and Adam Webber, senior sustainability officer at Camden council, and discuss what measures are in place and what more could be done to fight this issue,” say the Councillors. The latest statistics released this week show that Fitzrovia and other parts of central London has the worst “living environment” in the country. The meeting will also hear from an officer from the Licensing Enforcement Team, with Cllr Jonathan Simpson, Cabinet Member for Community Safety and Cllr Maryam Eslamdoust, Chair of Licensing. “A review of Camden ’s Licensing Policy is in its early stages and the council would welcome the opportunity to discuss the review and seek views from Bloomsbury and Fitzrovia residents, businesses and local people,” say the councillors. A Licensing Policy determines the council’s approach to granting licences for the sale of alcohol. The presentation will demonstrate the impact of alcohol in Camden , with police and public health information, and how the Policy can be updated to better address these issues.